At the close of the competition on Friday, 8th May, 2015, a total of 89 entries were received from girls in secondary schools across the country. 40 of the entries were screened off based on non-compliance with submission formats. There were four duplicate submissions of the remaining 49 entries leaving the judges with 45 entries for evaluation. Prizes will be awarded for the best three entries on Thursday 14th May, 2015 at Transcorp Hilton Hotel, Abuja by 12.00noon. Winners have already been contacted. 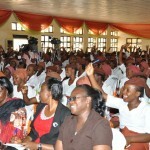 President Goodluck Jonathan today officially launched the Growing Girls and Women in Nigeria Initiative GWIN. 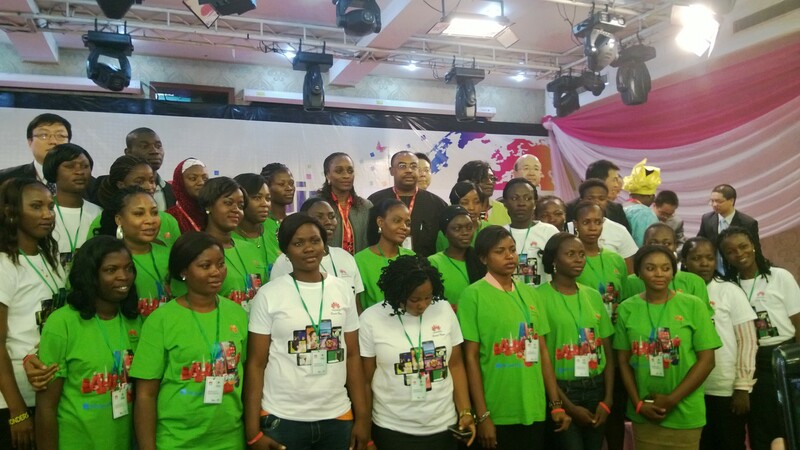 GWIN is an initiative of the Federal Government geared to empower women and girls in Nigeria. GWIN is being implemented through a memorandum of understanding signed by five pilot Ministries(The Ministries of Finance, Communication Technology, Agriculture, Water Resources, Health and Works). The participating Ministries are being financed by the Federal Government to develop the potential and earning power of women via the delivery of specific programmes services that will impact positively on the lives of Nigerian women. At the launching of the programme at the Presidential Villa, President Jonathan disclosed that the objective of GWIN is to open access to life changing opportunities for women and girls in diverse spheres and walks of life across the Federation. President Jonathan said that the GWIN project is a product of the collaboration with development partners –which became an implementable programme in 2013 under the leadership of the Coordinating Minister for the Economy and Minister of Finance, Dr. Ngozi Okonjo- Iweala. He emphasised that to ensure effective implementation of the GWIN project five ministries were selected as pilot implementing agencies and were asked to integrate the GWIN concept into the mandate of their respective ministries. He pledged that as a government, his administration will continue to give equal opportunities to women both big and small, so that they can continue to fly higher. The Minister of Finance and Coordinating Minister of the economy, Dr Ngozi Okonjo Iweala in her remarks, said that the present administration was using budgetary resources to start building women from the grassroots in the belief that when you empower women, you empower a nation. 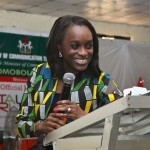 Minister of Communication Technology, Dr Omobola Johnson in a Presentation delivered at the launch disclosed that the Ministry via GWIN is empowering women and girls through specific technology initiatives identified and developed to empower Nigerian women and girls to actualize their potentials. The Ministry according to Dr Johnson is intervening to empower Nigerian women and girls via ICTs through three flagship programmes. The Digital Girls Club, 1,000 Girls ICT Training Programme and SmartWoman Nigeria project (SHE App). for girls in all secondary schools across the country. 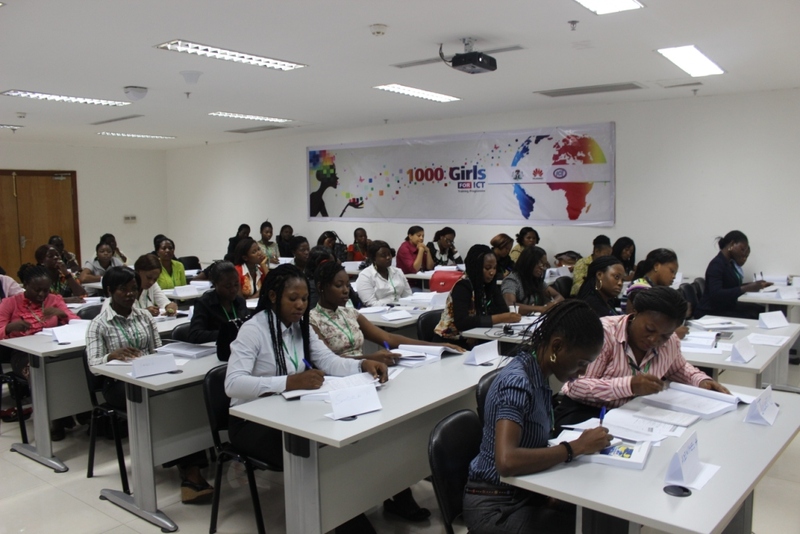 The Ministry through the 1,000 Girls in ICT Training Program has trained 1000 young female graduates of different tertiary institutions from across the 36 states of the Federation in the fundamentals of Telecommunications. 200 best-performing students were selected and are currently undergoing further training to become Huawei Certified Data Associates (HCDA). 20 top of the 200 will receive further training in China and upon completion of training programme, all 200 will be engaged in Huawei and associated facilities across the country. Dr Johnson at the occasion emphasised that many of the participants in the 1000 Girls programme did not have related background in ICT but performed excellently. A graduate of Economics was the best performing participant with a score of 98%. The third initiative of the Ministry, the SmartWoman Nigeria (S.H.E Mobile App) was developed as a brand of SmartWoman Nigeria to create the largest network of connected Nigerian women. The App will provide women with regular content on health, parenting, finance, business, etc. 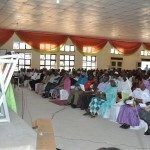 ; thereby empowering them to improve their lives. It will also afford them the opportunity to voice their opinion on issues that matters to them. Johnson stated that women in the rural areas on SHE Mobile App network will receive relevant content via text and voice SMS and where necessary in any of the five major local dialects. The work of the Ministry in the area of women empowerment via ICTs attracted the attention of the International Telecommunications Union ITU. From 360 nominations from 74 countries, Nigeria emerged winner in ITU’s 7th Category of “ICT and Broadband strategies, policies and frameworks that promote women’s digital empowerment. Dr Johnson, who expressed delight at the successes recorded via the Ministry’s GWIN interventions, emphasised that to sustain the programs beyond 2015, the Ministry will develop a framework to enable private sector participation in SmartWoman Nigeria and Digital Girls Club. The Ministry also intends to develop other Mobile Apps specifically aimed at empowering Nigerian women and girls as well as introduce other specific ICT-driven initiatives to foster gender inclusion in Nigeria. Some members of the Digital Girls Club gave memorable testimonials that highlighted the crucial role the Club is playing in demystifying ICTs. The federal Ministry of Communication Technology has launched the SmartWoman Nigeria and 1000 the ICT Girls training initiatives as part of federal government’s efforts to empower women and girls under the Girls and Women Initiative in Nigeria (GWIN) program. 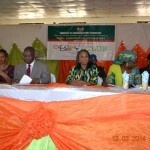 The two empowerment initiatives were launched in Lagos on the 4th of November 2013. The SmartWoman Project is a mobile service conceived to support the advancement, development and education of Nigerian women via the platform provided by ICTs. The initiatives will help empower Nigerian women and girls in ICTs. SmartWoman Nigeria, will allow women connect with one another, share their knowledge and learn from each other; and through that empower themselves to achieve their goals. The Ministry also flagged off in partnership with Huawei, a leading global information and communications technology (ICT) solutions provider a training program that will empower girls with ICT skills to make to improve the employability of the girls and increase their interest in pursuing careers in ICT. The three day training programme will also empower the 1,000 girls with ICT skills and knowledge in the knowledge economy. 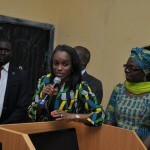 Minister of Communication Technology (FMCT), Mrs Omobola Johnson while speaking to IT Journalists during the launch of both initiatives said that it was time the imbalance in ICT adoption and appropriation among men and women was removed. The Minister emphasized that ICTs have the transforming power to accelerate the development of women by helping them to be more efficient and effective in their jobs, careers, and business and to generate new employment opportunities. Mrs Johnson stressed that ICT has unlimited potential to significantly contribute to increasing the social welfare of women. She said that the Ministry was committed to empowering women and girls to embrace ICTs to actualize their potentials and contribute to the economic development of Nigeria through various technology initiatives. The Federal Ministry of Communication Technology, today, launched twelve Digital Girls ICT Clubs across the six geopolitical zones of the country at the Federal Government Girls College, Bwari. The Digital Girls Club initiative is an early intervention project of the Ministry of Communication Technology aimed at empowering and encouraging Nigerian girls in secondary schools to develop an early interest in ICT. The initiative will also help demystify ICTs and project technology as a viable career option that can empower and impact positively on the future of the girls. The Digital Girls Club is part of the Girls and Women initiative of the federal government geared at empowering Nigerian women and girls. The administration of President Goodluck Ebele Jonathan in a bid to empower women and girls in Nigeria created a gender empowerment scheme titled Girls and Women in Nigeria (G-WIN) with the sole aim of positively impacting and improving the lot of women and girls in Nigeria. To enable this empowerment process, five Ministries- Ministry of Communication Technology, Agriculture, Works, Health and Water Resources signed MOUs with the Ministry of Women Affairs and Finance to empower women and girls through specific interventions and services geared at improving the lives of women and girls in Nigeria. The Ministry of Communication Technology, a key partner in the G-WIN project is empowering women and girls through specific technology initiatives it has identified and developed to empower and enable Nigerian women and girls actualize their potentials. 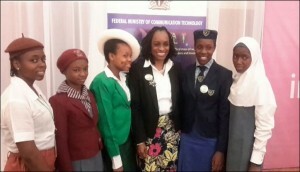 The Digital Girls ICT Clubs being launched in I2 federal government girls’ schools is a pilot that will encourage, motivate and stimulate the interest of the girls in ICT-skills, knowledge and careers in a non-threatening manner. The Clubs will also demystify ICTs and project technology as a viable career option that can empower and impact positively on the future of the girls. 1200 girls from the 12 pilot will be impacted upon in the first instance, and the Clubs will be set up across all the Federal Government colleges in all the states of the federation later. A curriculum that will excite, transform and positively impact on the girls has been developed, and the girls will be taught relevant technology skills that will transform their lives. 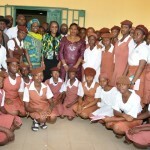 A portal www.digitalgirls.org.ng has been created to act as a key tool for also stimulating and empowering the girls to embrace and adopt ICTs. The aim of these Clubs is to remove the barriers that discourage girls from embracing ICTs. To ensure sustainability and build capacity, the Girls Club will collaborate with ICT teachers of the various schools to teach exciting programmes that will interest the girls-quizzes, ICT games, application development, animation, website development, blogging, graphics design, games, computer programming, etc. The Clubs will be manned by professionals who will play a key role in stimulating the interest of the girls. Periodically mentors will be invited to give inspiring talks and participate in various ICT related activities that will interest the girls. The aim of these Clubs is to help to encourage young girls to embrace ICTs in order to bridge the existing digital divide between males and females. Current statistics in Nigeria reveals that Nigerian women makeup 50% of the population but hold less than 20% of ICT jobs in the country. Also only about 33% of women are online in Nigeria. The Broadband Commission Working Group on Broadband and Gender in a new report entitled ‘’Doubling Digital Opportunities: Enhancing the inclusion of women and girls in the information society’’ lamented the pervasive gap in access of women to ICTs globally. According to the report, there are currently 200 million fewer women online than men and this yawning gap could grow to 350 million in three years. The report also reveals that globally women are coming online later and more slowly than men. The report added that, of the world’s 2.8 billion Internet users, only 1.3 billion are women. The report states that women account for fewer than 20% of ICT specialists in developing economies. The report also estimated that, by 2015, 90% of formal employment across all sectors will require ICT skills. The Digital Girls clubs will be deployed to remove the barriers that discourage girls from embracing ICTs. The goal is to ensure that more girls embrace and adopt ICTs. The Clubs will be manned by the ICT teachers of the twelve schools who will play a key role in stimulating the interest of the girls. Periodically mentors will be invited to give inspiring talks and participate in various ICT related activities that will interest the girls. The Clubs will teach a number of ICT skills including building websites and games, computer programming, graphics design, assembling and dissembling computers and creating short films. The Clubs will provide learning in a fun and engaging way and direct technical assistance for the girls. It will also provide a forum where the girls can easily interact with mentors. The activities in the club which will be done on a weekly basis will deepen the girls’ technical skills as they are introduced to additional concepts and skills. The girls will also participate in a mixture of classes and workshops, presentations and excursions. ‘’We need to increase the participation of women and girls in ICTs. Getting more girls into ICTs is a task we are committed to at the Ministry of Communication Technology. We want to ensure that Nigerian girls encouraged and empowered to embrace ICTs. It is critical to get girls to adopt ICTs so that they are not left behind in the digital revolution changing communities and nations across the globe. Our desire is that the Digital Girls ICT Clubs will empower Nigerian girls and lead to the development of an army of ICT compliant girls that will contribute to the economic growth and empowerment of Nigeria in the future’’. The Minister of Women Affairs, Hajia Zainab Maina represented by a Deputy Director-Women Affairs Department, Mrs. Nkechi Onwukwe said ‘’ the Internet is a crucial tool used today to transform lives of people by helping them to embrace and cultivate new skills in various endeavors. Girls should avail themselves of the opportunity presented to them by the establishment of the Digital Girls Club to gain relevant ICT skills that will help them achieve their desired career objectives. The Minister of Education, Mr. Nyeson Wike in his comments commended the Ministry for the launch of the Digital Girls Club project geared at entrenching and promoting digital skills in young girls in Nigeria.